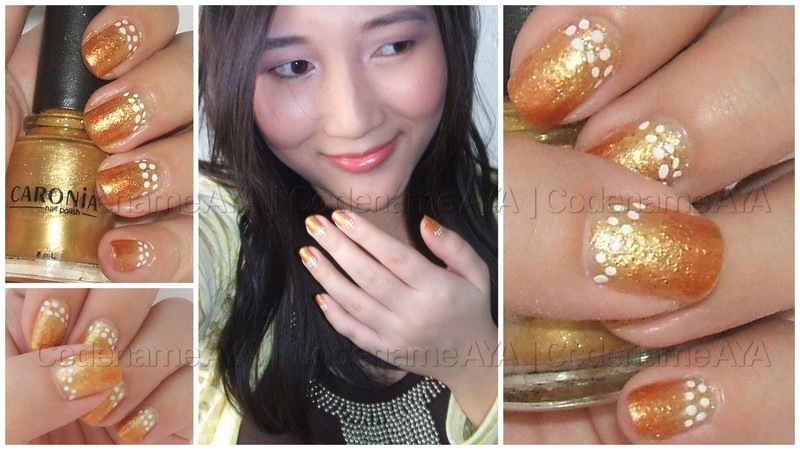 Anyway, this nail design was my entry to Caronia's January website promo. The goal was to create an original design inspired by any of these three New Year symbols: polka dots, round fruits and fireworks. Nails of the day with Caronia nail polish in Golden Sun, Elianto nail color in Bronzy, Wish gold glitter top coat, and Etude House Petit Darling Nails in WH702. Since gradients seem to be the only kind of nail art I'm good at, I chose to go with that as my background. Then I just added some dotted detailing at the base. I had a hard time choosing what color the dots should be. Ended up with white, haha. Some of the dots weren't perfect even though I used a legit dotting tool, and the dotted lines weren't as straight as I wanted them to be. 'Twas frustrating, really, but I didn't want to re-do everything. Here's my actual entry. They said it has to be a beauty shot (for identification purposes), hence the shot there in the middle. so beautiful honey, it's just beautiful!! I like the gradient effect and you nails make me think of citrus and the added dots is a nice touch.